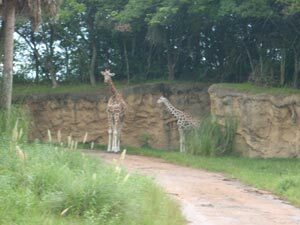 Your One-Day Schedule For Animal Kingdom | Planning A Walt Disney World Trip? Planning A Walt Disney World Trip? Animal Kingdom happens to be the largest of Disney’s four theme parks. That being said, you definitely won’t see everything in a day, but it is possible, as with all the parks, to hit the major highlights and still have a wonderful time. This however takes some planning on your part, and obviously every person’s plan will look a bit different based on likes and dislikes. However, there are some basics that hold true for all theme parks and that’s what I will cover here! First of all, buy your tickets in advance. There is nothing worse than wasting two hours of your day standing in a long line to purchase entry tickets. That is not getting off to a good start at all! Also remember to arrive at least an hour early to park. Lines are extremely long in the morning and many times the parks will open early to allow for parking. Because both Cast members and the animals are just starting their day, mornings are very busy. Rafiki’s Planet Watch and viewable medical procedures happen in the morning and also morning is the best time for animal spotting’s on the Safari, so you will need to decide ahead of time which you’d prefer to do. If you decide ahead of time whether or not your group is willing to split up to ride the Expedition Everest coaster can also shave some time off your day. Instead of heading there first thing and fighting the huge morning crowd, you can wait until later in the day and use the single riders line. Another thing to note, is don’t attempt to walk all the nature walks. It’s impossible and you can still see a good chunk just by varying your routes from attraction to attraction. Also, remember to dress appropriately. Florida is hot and muggy and tends to rain when you are least expecting it. So go prepared, and if you find yourself running out of steam due to heat and lack of food, head on over to Africa’s Tusker House to grab an afternoon lunch and much needed rest. It is one of the few places offering indoor dining, and a great place to have a bit of a noon time break with out actually leaving the park and fighting to get back in. You can also get a little wet if you find yourself getting hot mid day and want to do a bit of cooling off, at the Kali River Rapids. It is a thrill ride with a message and you are sure to get a kick out of it. You will also want to remember that Animal Kingdom closes a little earlier than the other parks. As early as 5pm in off season, and 8pm in peak season. When creating your schedule for the day, keep that in mind so that you can be sure to see everything you hope to see. Also take advantage of a bit of psychology and look for empty lines to the left. Unless something is roped off, it is probably not closed, but because most people tend to veer to the right, many don’t even realize there are less crowded rides off to the left. Finally, don’t forget to enjoy the details of Animal Kingdom. Part of it’s charm is that it’s a theme park and animal habitat all wrapped up into one. Nature trails abound, and there are tons of unique things to see and do besides the major attractions. Enjoy that, as it’s something you won’t necessarily find at other theme parks, and have a wonderful Animal Kingdom experience! This entry was posted on Tuesday, July 6th, 2010 at 2:03 pm and is filed under Things to See. You can follow any responses to this entry through the RSS 2.0 feed. You can leave a response, or trackback from your own site.